“I could wring the old thing’s neck that put it there! And highwaymen.” The wild girl laughed. Originally it was the road that got moved and not the pub that got hidden. The White Horse was a coaching inn and the story goes that the road was straightened in the early nineteenth century, leaving it isolated behind trees and hedges, down a narrow lane. There was a sign on an iron post on the road, indicating the inn’s existence but the locals so much enjoyed having the place to themselves that they took it down. The White Horse became known as the Pub With No Name. The frame on the iron post is still there and still vacant, but now a road sign indicates where to turn off, which is handy but rather spoils the sense of discovery. Edward Thomas lived with his family in the village of Steep, a couple of miles away. His first known poem, ‘Up in the Wind’ is about the White Horse and a barmaid there. Thomas loved this part of Hampshire, and fed his imagination by walking its hills and woods and combes. The locale was a kind of Eden for him and the White Horse is an Edenic kind of pub, ancient and snug. Though I doubt you’ll find many impecunious poets or agricultural labourers among the clientele now. Earlier in the day I walked past one of the houses that Thomas rented, and a struggling young writer of our time, with a family, would not be able to afford a residence of that character, with that kind of view over Ashford Hangers. Affluence and the motor car have done their work in this part of England too. 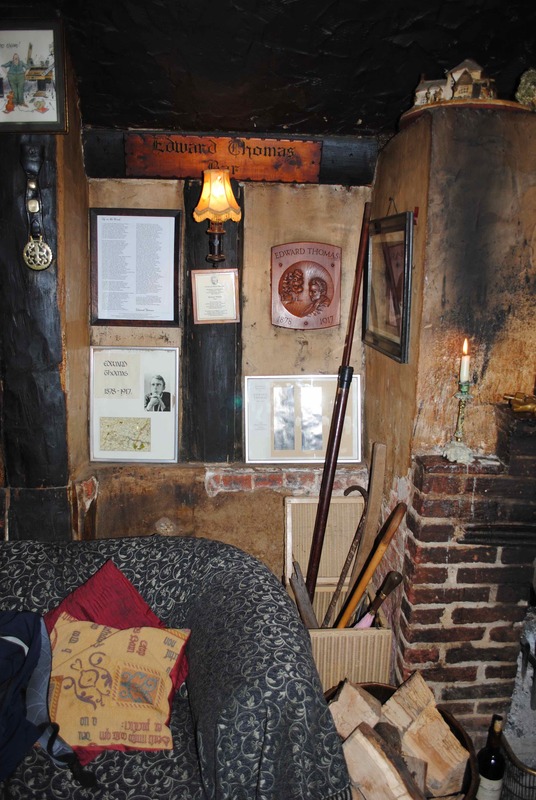 Thomas was one of the White Horse regulars and the smaller of the bars, named after him, has a wooden plaque put there by the Edward Thomas Fellowship, along with some memorabilia. What of the place as an actual pub? Thankfully, there are no bogus antique-shop effects about it, and no reek of the heritage trail, though the clientele is more chartered surveyor than farm labourer. I could have sat there, downing pints and reading Thomas’ verse, all afternoon. But I had driven for a couple of hours to get to the White Horse and had to drive back the same way, which meant that getting slowly sozzled on beer and poetry was out of the question. Reluctantly I left what Thomas called ‘that forest parlour,/Low and small among the towering beeches’ and headed for home.